Though many Americans spent a significant chunk of their Sundays watching the National Football League’s conference championship games we here at 10,000 Birds assume that you probably spent at least some portion of your weekend out looking for birds other than the Seattle Seahawks, who will be representing the National Football Conference in the Super Bowl on 2 February. Of course both Mike and I were out and about spotting some birds this weekend. 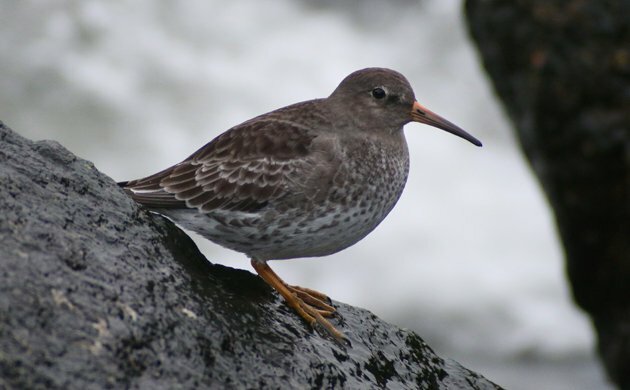 I could have chosen any of the four Snowy Owls I saw this weekend as myBest Bird of the Weekend but I decided that I preferred a Purple Sandpiper at Breezy Point, Queens, (pictured above) mostly because it was feeding on a jetty while waves crashed over it. What a great little bird! Mike enjoyed a bevy of rural Pennsylvania feeder birds this weekend. The best of the bunch was a hulking Hairy Woodpecker that dwarfed the diminutive Downies around it. My favorite birds of the weekend were a pair of ring-necked ducks on a pond behind our house. I wish I could attach a picture. We also have a pair of Egyptian geese that have been here for a couple of weeks. they are most unusual looking and not the least intimidated by my presence. I succeeded in finding the Great Gray Owl, so it’s not even up for debate. What an incredible bird! And I was able to show it to a couple of friends, too. I located a New Zealand Falcon in the sanctuary. Nice not to have to leave this bird till the end of the year for my year list! A Bridled Tern near the wharf in very windy weather! A leucistic Canada Goose. Last Monday I saw a flock of Canada Geese fly over and the second bird in the V was all white with a orange bill. It sure looked like a Snow Goose, an uncommon bird in our area. Sunday I got an email from a friend that there was a leucistic Canada Goose at a local spot. After checking it out I decided it had to be the same bird, so off the county list it went. Gray Partridges, FINALLY! They’re pretty rare where I’m from, and I’ve wanted to see them for years. It was a good sighting too – a lone bird slowly crossing the quiet farm road as I rolled up in my car, then suddenly partridges were exploding out of the ditches on either side of me!